Prime Minister Samdech Akka Moha Sena Padei Techo Hun Sen of the Kingdom of Cambodia received here yesterday at the Peace Palace visiting Minister of Public Security of the People’s Republic of China H.E. Zhao Kezhi. According to H.E. Eang Sophalleth, Assistant to the Cambodian Premier, in the courtesy meeting, H.E. 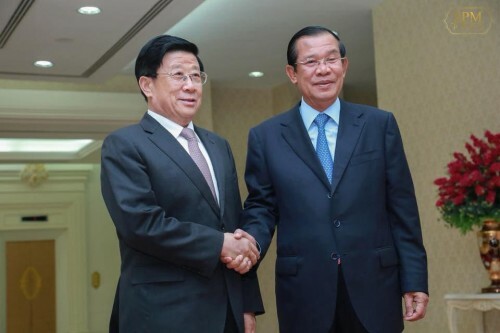 Zhao Kezhi conveyed the Chinese leaders’ greetings to Samdech Techo Hun Sen. The Chinese minister said the purpose of his visit, the first time in Cambodia, is to boost the cooperation between the two countries in terms of security as well as law enforcement. H.E. Zhao Kezhi laid stress on the strong and long-lasting friendship between Cambodia and China and reaffirmed his country’s continued support to the key benefits and development of Cambodia both in the bilateral and multilateral framework. For his part, Samdech Techo Hun Sen expressed thanks to the Chinese leaders for their greetings and his satisfaction with the good relations and cooperation between both nations. The Prime Minister briefed H.E. Zhao Kezhi on the current situation in Cambodia and encouraged him to further discuss the cooperation on law and security enforcement with Samdech Kralahom Sar Kheng, Deputy Prime Minister and Minister of Interior of Cambodia. Samdech Techo Hun Sen also welcomed the memorandum of understanding on combating terrorism and cybercrimes signed here on Friday afternoon by the Cambodian Ministry of Interior and the Chinese Ministry of Public Security.